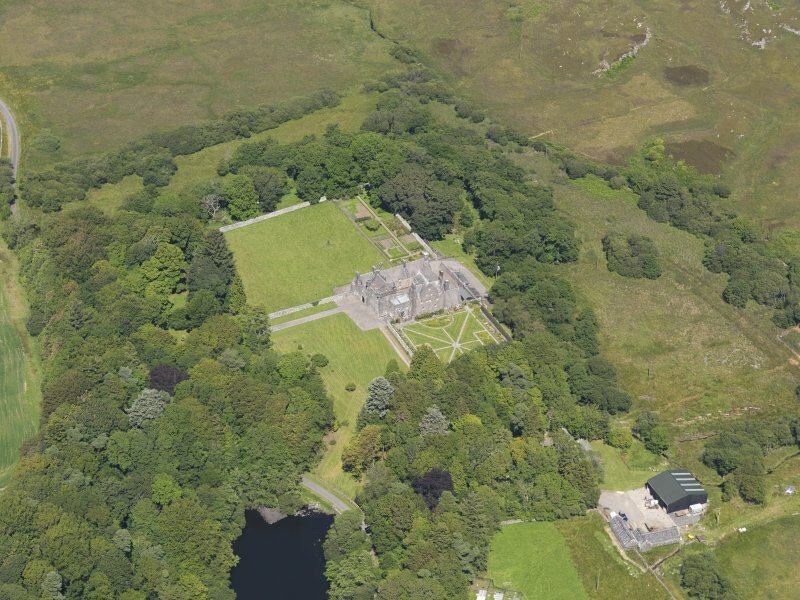 Oblique aerial view of Old Place of Mochrum, taken from the SSE. 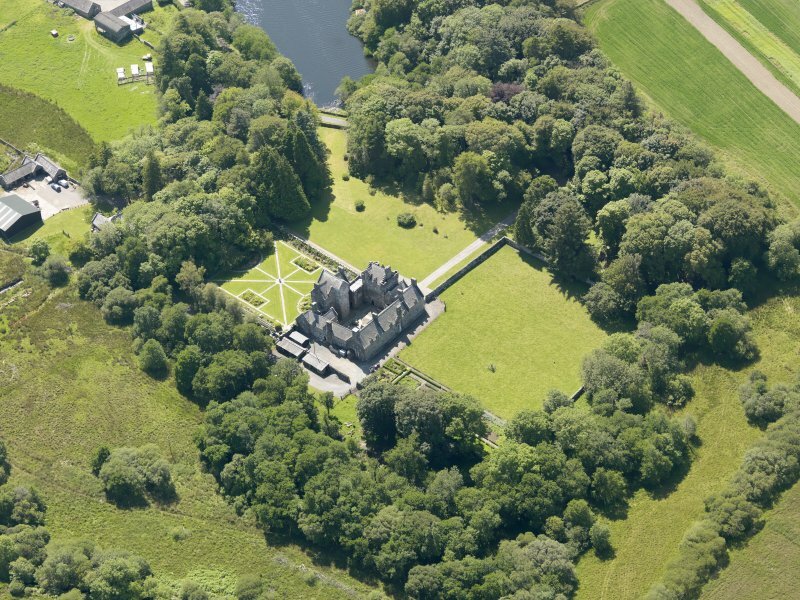 Oblique aerial view of Old Place of Mochrum, taken from the WSW. 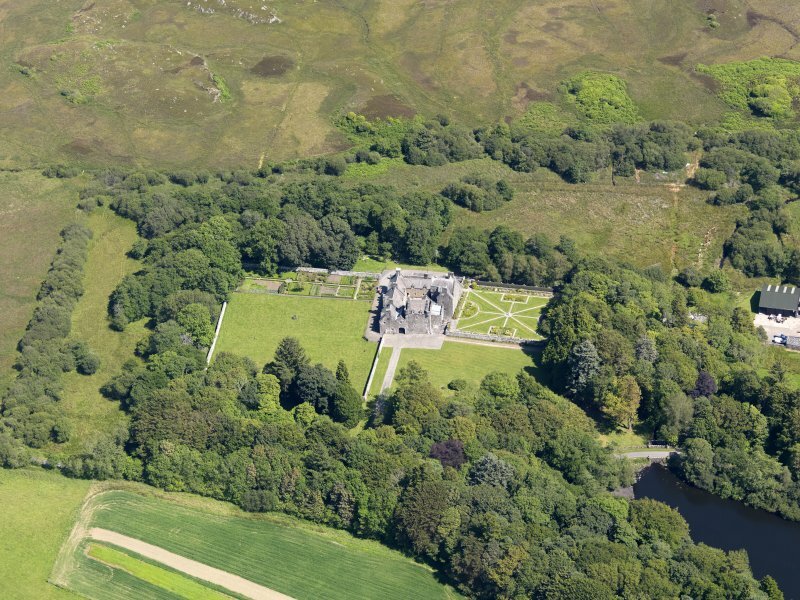 Oblique aerial view of Old Place of Mochrum, taken from the NE. 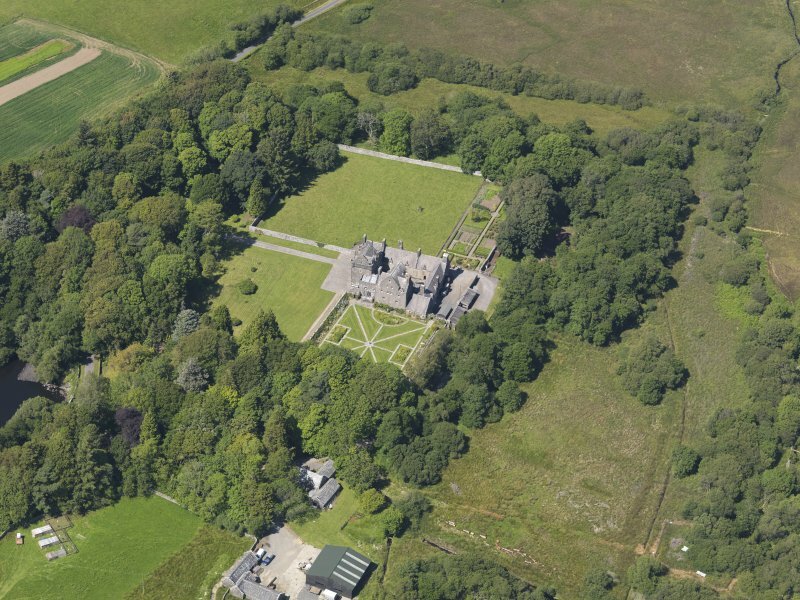 Oblique aerial view of Old Place of Mochrum, taken from the E.
Oblique aerial view of Old Place of Mochrum, taken from the SSW. 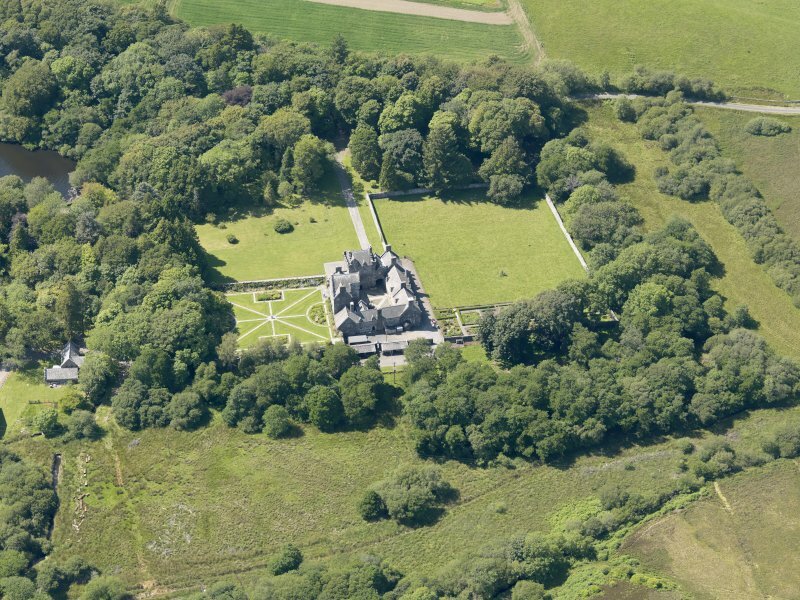 Oblique aerial view of Old Place of Mochrum, taken from the WNW. 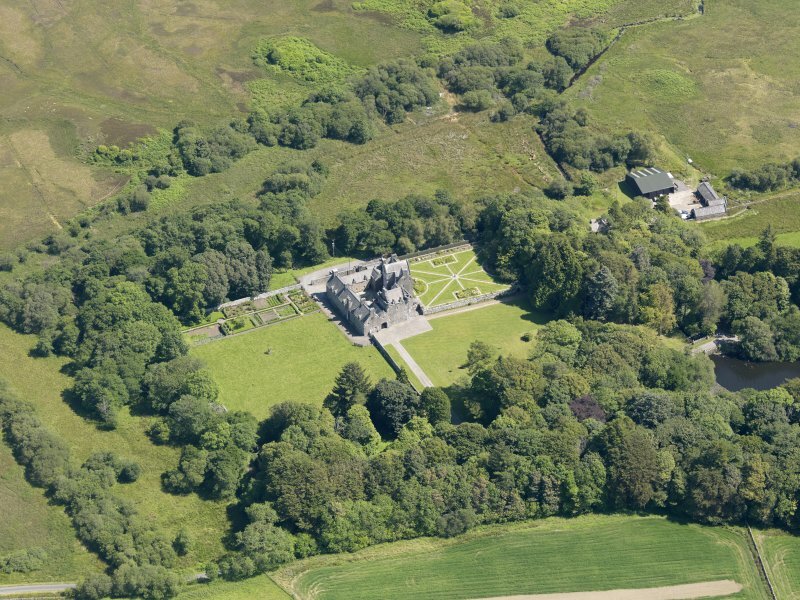 The Old Place of Mochrum, also known as Drumwalt, consisted of two towers, circa 15' apart, linked by a high wall and stood in ruins until 1876 when renovation and extensions after the old style were commenced. The west tower is the older of the two, probably dating from circa 1500. It is a plain rectanguler building four storeys and a garret in height with walls 5 1/2' thick and has been finished with angle-turrets, a capehouse and a parapet walk. The upper portions have been rebuilt, carefully reproducing the old form. 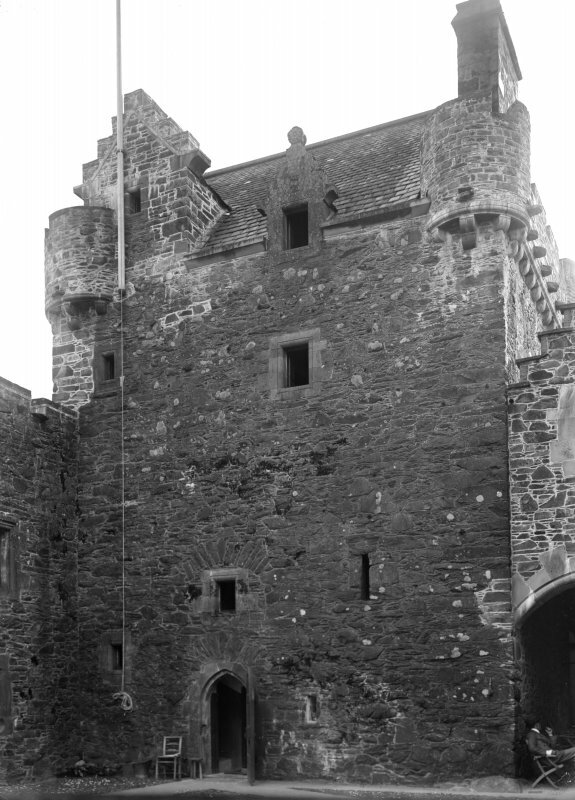 The east tower, probably dating from the end of the 16th century, is also rectangular but with walls only 4' thick. It differs from the west tower in having neither angle-turrets nor parapet. The gables and upper floors have been renovated. The entrances to both towers were covered by a pend or archway 7' wide, only the foundation of which survived in 1889. It is probable that the courtyard formed by the modern buildings on the north and east occupies the site of one simply enclosed by high walls. 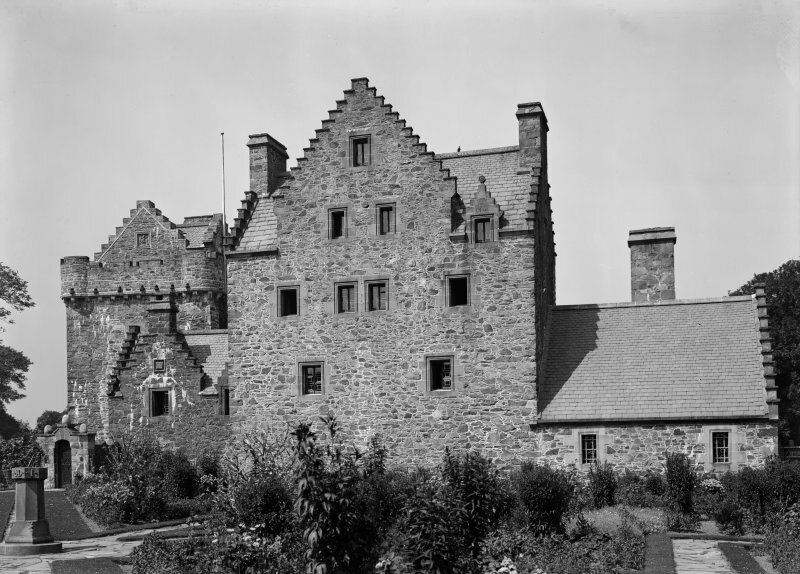 The property belonged to the Earls of Dunbar and March until circa 1694 when it passed to the Earls of Dumfries. The Marquis of Bute acquired it c1876. This building is outstanding and is as described by the previous authorities. Visited by OS (BS) 7 July 1976. Extracts from Office Contracts Books, Fee Books - Typescript (R//P109) etc. Photographic survey of Old Place of Mochrum, Wigtownshire. 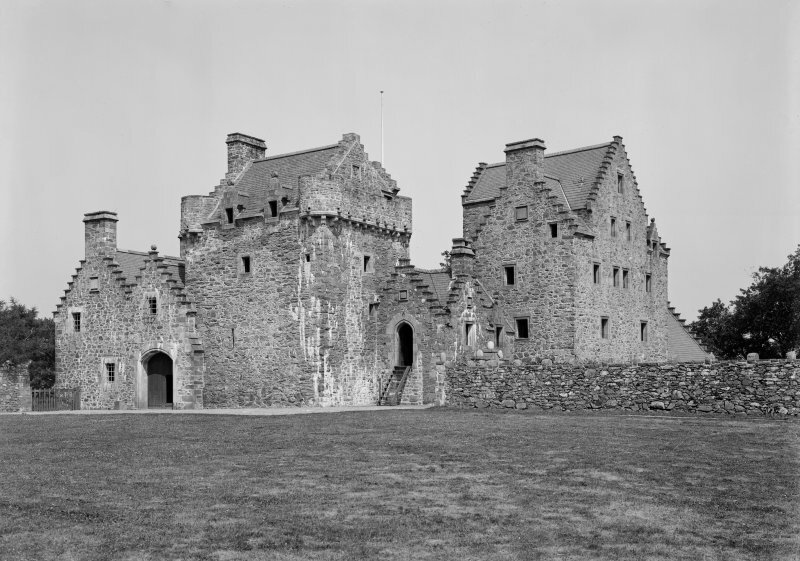 The photographs are undated but may have been taken by the National Buildings Record Scottish Council between 1941-1953.